Nestled in the Himalayas of Tibet, Mount Kailash is an important spiritual site of pilgrimage for practitioners of four Asian religious traditions: Hinduism, Tibetan Buddhism, Jainism and Bőn (the indigenous, pre-Buddhist Tibetan spiritual system). The mountain is regarded as the spiritual center of the universe in these four major religious traditions. In Tibetan Buddhism the mountain in regarded as the abode of the tantric meditation deity, Demchog. For Hindus, the mountain is home to the God Shiva, one of the primary gods in the Hindu pantheon. According to the Jains, this mountain was the site where their first prophet received enlightenment. For Bőn practitioners, the mountain is the center of spiritual energy and power. For all these reasons, the mountain is sacred and an important site of pilgrimage (Sacred Land Film Project). Pilgrims from all four traditions have come for years to complete ritual walks around the base of the mountain. This ancient religious and cultural expression has been inhibited by the Chinese rule ofTibet. The Chinese government is threatening both the ability of religious practitioners to access this important pilgrimage site and the preservation of its sacred character through increasing access for tourists and the destruction of some important religious sites and monasteries on the pilgrimage route. Since the beginning of Chinese rule in Tibet, access to the mountain for pilgrims from all four religious traditions has been severely restricted. WhileChinahas recently agreed to increase the number of pilgrims from India allowed to visit Mount Kailash, the allotted numbers still do not meet the demand (Tibetan Review 2010, 25). Chinese rule has inhibited the practice of religious ritual by Tibetan Buddhists, viewing it as a possible mode of organization for political dissent. Often in order to participate in rituals at religious sites, Tibetan Buddhists are made sign a declaration denouncing the Dalai Lama’s political authority and recognizing the unity of China and Tibet (Sacred Lands Film Project). This integration of political issues into a religious tradition severely decreases access of religious practitioners to their sacred land. Restrictions on pilgrimage are also having a major effect on Hindus. The Chinese government has been refusing to grant visas to Hindus from India for the traditional summer pilgrimage to the home of Lord Shiva at Mount Kailash. The pilgrimage is believed to bring the pilgrim closer to the divine. The restrictions are said to be because of political reasons, a result of protests in Tibet (Timmons and Kumar, 8). For both Hindus and the Tibetan Buddhists, political motives of China interfere with religious activity at Mount Kailash. As a mode of religious oppression in occupying Tibet, many sacred monasteries and sites around Mount Kailash have been destroyed by the Chinese. During China’s Cultural Revolution when religious practice was forbidden in China, six monasteries, both Buddhist and Bőn, were destroyed around Mount Kailash (Sacred Lands Project). An example of this continued destruction of sacred sites is the destruction of a statue of Padmasambhava (Guru Rinpoche) by armed Chinese security personnel in 2007. The statue was located near the beginning of the pilgrimage route around Mount Kailash (Tibetan Review 2007, 7). Though Buddhist practitioners attempted to protect the statue by forming a circle around it, it was torn down regardless. Through these actions by the Chinese, many important monasteries and sacred sites have been severely damaged and with them, the pilgrimage route as a whole. While the ability to make pilgrimage to Mount Kailash is being severely restricted by China, the area is becoming increasingly more accessible to tourists. Contributing to this massive flow of tourists are several developments in the area such as the Ngari airport, the upgrading of the road from Lhasa, and hotels and restaurants being built near Mount Kailash (Tibetan Review 2009, 5). The Tibetan Review describes, “Devout Tibetan pilgrims may soon have to struggle for praying and prostrating space with curious tourists, many of them traveling in vehicles” (Tibetan Review 2009, 5). CulturalChina.com, a website promoting tourist opportunities in Tibet, describes the opportunity to circle Mount Kailash with a private tour guide in a seventeen day package deal. The description of the trip focuses on the natural beauty of the area saying, “The journey to Mt. Kailash takes three days, and throughout we are constantly engulfed by the panoramic stretches of infinite horizons, radiant sapphire lakes, and staggering snow-capped peaks” (http://culturalchina.com/). Less emphasis is placed on the sacred importance of the mountain and nothing is mentioned in regards to respecting religious pilgrims who may be visiting the site at the same time. It is clear from the nature of the site that the mountain is indeed becoming more accessible to tourists. This increased accessibility to non-religious visitors detracts from the secluded and sacred nature of the place. For an example of how tourism has begun to blossom around Mount Kailash and the irreverence of some tourist visitors to the sacred nature of the site, view this video created by video blogger Ken Schreiner at http://www.youtube.com/watch?v=sxgnTLHQW_4. For both Tibetan Buddhists and Hindus, the mountain is home to an important deity. This idea that a deity would actually live on the earth is a concept in indigenous religious traditions that the is difficult for most people in the US to comprehend. Robert Michaelsen notes in his article on the American Indian Religious Freedom Act, that in indigenous traditions, land forms are often regarded as the abodes of gods or as gods themselves. Harm inflicted on the land by human disturbances can thus inhibit the effectiveness of religious ceremonies and the powers of the gods there (Michaelsen, 105). This component of the difficulty China’s actions have inflicted on the religious practitioners, who see Mount Kailash as sacred because it is home to a deity, is easily overlooked by prominently Christian onlookers in Europe and America. For these Westerners, it is difficult to comprehend the idea of God living on a mountain on the physical earth, and thus it is difficult to comprehend this component of the issue of protecting this sacred land. This cultural gap in religious understanding may contribute to the issue receiving less international sympathy than it may otherwise receive. Despite this gap in understanding, there is a universal aspect to the sacred nature of Mouth Kailash. The sacred mountain is what Mircea Eliade describes as an axis mundi. Eliade describes the axis mundi as a mythical center of the universe and a common religious conception prevalent in traditional societies. A mountain is a common image for this “universal pillar, axis mundi, which at once connects and supports heaven and earth” (Eliade, 36). Eliade’s model of the sacred is ontological. For him, certain places are inherently sacred and reveal themselves to us. Humans do no make land sacred; they discover it to be sacred. Eliade would describe Mount Kailash as one such sacred place. Eliade further describes his idea of the axis mundi saying, “Around this cosmic axis lies the world (=our world), hence the axis is located “in the middle,” at the “navel of the earth”; it is the Center of the World” (Eliade, 37). This description fits the religious perception of Mount Kailash as the spiritual center of the universe. This congruency of four religious traditions with Eliade’s theory suggests that the mountain may very well be a sacred space, a place where the veil between worlds is thin, and thus this sacred land deserves a greater respect than what it is currently receiving under Chinese control. Chinaallows more Mt Kailash pilgrims fromIndia. (2010). Tibetan Review: The Monthly Magazine on all Aspects of Tibet, 45(5), 25. CulturalChina. “On the Pilgrimage Trail of Mt. Kailash.” http://scenery.cultural-china.com/en/159Scenery4083.html. Accessed:Nov 3, 2011. Eliade, Mircea. The Sacred and the Profane: The Nature of Religion.Orlando: A Harvest Book Harcourt, Inc., 1957. Guru statue demolished near Mt Kailash. (2007). Tibetan Review: The Monthly Magazine on all Aspects ofTibet, 42(12), 7-8. Michaelsen, Robert. The Significance of the American Indian Religious Freedom Act of 1978. Journal of theAmericanAcademyof Religion,LII/1. p. 94-115. Pilgrims to jostle with tourists as Mt Kailash ‘developed’. (2009). Tibetan Review: The Monthly Magazine on all Aspects of Tibet, 44(5), 5. Sacred Land Film Project. Mount Kailash. 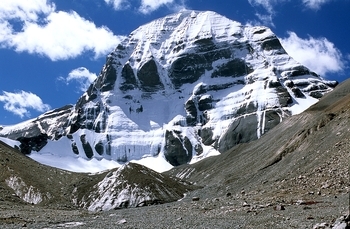 http://www.sacredland.org/mount-kailash/. Accessed:Nov. 3, 2011. Timmons, Heather & Hari Kumar.ChinaBlocks Thousands of Hindus FromTibetPilgrimage. New York Times. (2008, May 21). p. 8.